Late last year, New York Times bestselling author and founder of Peak Potentials, T. Harv Eker, announced that Peaks Potentials had been acquired by Success Resources, an event production company that stages live and online events around the world in the personal success training category. “There is a wide misconception in society about the motivational training business. I hate to disappoint readers, but this industry is not a money-grabbing scheme; the Millionaire Mind Intensive is not a scam. We know – as do our clients – that you can make your fortune by following the simple tips that we teach” says Markel in his first press appearance since being named Chief Executive Officer of New Peaks in November. Their flagship program, The Millionaire Mind Intensive, is a one-of-a-kind program where you spend three days rewiring your brain so you will think like the millionaire you want to be but for some reason have not yet become. During the course participants experience more than just a bit of ‘money talk’. Participants are encouraged to do emotional searching of why they act the way they do around money, and learn how to replace old patterns with new affirming and beneficial patterns that will also break them through blocks that are holding you back from success. Plus participants will leave with a simple yet powerful way of tracking money to help move towards total financial freedom. Now, Peak Potentials is pleased to announce that the Millionaire Mind Intensive has been revamped to bring new and fresh content to the Vancouver marketplace from where the Millionaire Mind Intensive originated. The event has already seen many enhancements since it first appeared on the Vancouver success training scene in 2005, and many world-class entrepreneurs and business owners attribute their success to Peak Potentials and their teachings. Today, the event is structured to ensure that participants are armed with a new set of skills and information to survive and succeed in our new world; where technology is consistently evolving how we work both locally and on a global scale. “If you want to succeed today, you need to “reposition” yourself. You need to revamp how you do business, and change how you handle and invest your money. That’s where Peak Potentials comes in.” says Markel. 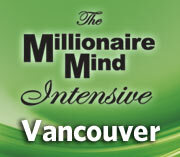 Peak Potentials will be presenting the Vancouver Millionaire Mind Intensive from March 16-18, 2012 at the Hilton Vancouver Metrotow, 6083 McKay Avenue. Normally valued at $795 each, a limited release of free General Seating Tickets has today been made available. Register at http://MillionaireMindIntensive.com/thanks, while tickets last.